ROME—This latest journey of Cardinal-designate Joseph W. Tobin to Italy can be viewed as a great American success story—with a twist. After all, the focus of this story isn’t on power, wealth or fame. Rather, it’s on the foundation of faith, family and humility. Start with the fact that he was a boy from Detroit who knew the challenges of the streets. Add in the detail that he is the oldest of 13 children who grew up in a family that lived in one half of a duplex for all of his childhood and his youth. Include the heartbreaking element that he lost his father—his role model—at a young age. Yet instead of derailing his future, those realities and challenges helped to form the strong foundation of his life, leading now to a special moment when he will be elevated to one of the most honored positions in the Church. That’s the Twitter account version of the life of Cardinal-designate Tobin who will be installed as a cardinal by Pope Francis on Nov. 19 at St. Peter’s Basilica at the Vatican. During the ceremony which is called a consistory, Cardinal-designate Tobin will be one of 17 new cardinals to receive his cardinal’s ring and a biretta—a four-cornered red hat—from Pope Francis. The pope will also give each new cardinal a scroll with the “title” to a church or parish in Rome, making him an honorary member of the clergy in Rome. For Cardinal-designate Tobin, his selection initially led him to be shocked and humbled when Pope Francis announced the list of new cardinals on Oct. 9. 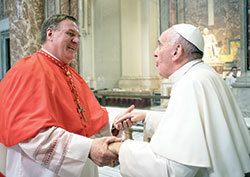 At 64, Cardinal-designate Tobin will become the youngest of the 18 American-born cardinals. His selection as a cardinal has also led more than 200 people—including his 93-year-old mother, a large group of family and friends, and a strong delegation of priests, colleagues and faithful from the Archdiocese of Indianapolis—to travel to Rome to be there for him at this special time. They will also be there for the first Mass he celebrates as a cardinal. With Pope Francis and other cardinals, he will concelebrate the 10 a.m. Mass on Nov. 20 in St. Peter’s Square, a liturgy that will close the Holy Year of Mercy that began on Dec. 8, 2015. During the weekend, he will also undoubtedly dote on his mother, Marie Tobin, who still had children as young as 5 and 6 when her husband died. Her oldest child knows she has always believed that her husband has been with her through the years, helping her raise their children. Diversity has been a defining element in his ministry since he was ordained as a Redemptorist priest in 1978. He is fluent in five languages—English, French, Italian, Portuguese and Spanish—and he has traveled to more than 70 countries. The former leader of the Redemptorist order also has a heart for immigrants and refugees. And when he is installed as the new archbishop of the Archdiocese of Newark on Jan. 6, he will begin to oversee a four-county area of about 1.5 million Catholics where Mass is celebrated in 20 languages each weekend. He definitely has a heart for the people of the Archdiocese of Indianapolis. When he became the spiritual leader of the archdiocese in 2012, he viewed “Hoosier Hospitality” as a tourist slogan. After four years in the archdiocese, he has come to know it as a way of life that has connected him to the 225,000 Catholics—and many other people from different faiths—in the 39-county area. Because he was reassigned to the Archdiocese of Newark before his installation as a cardinal, the Archdiocese of Indianapolis will have no historical claim to him as a cardinal. But there is no denying the emotional and spiritual bond that connects Cardinal-designate Tobin and the faithful of the Church in central and southern Indiana. The thought of his elevation as a cardinal—and then the announcement of his reassignment to Newark—have led people in the Archdiocese of Indianapolis to often include the word “bittersweet” in describing their reaction to those two pieces of stunning news. That feeling still lingers at the beginning of the weekend of Nov. 19-20, but the joy and pride for Cardinal-designate Tobin also swells as his date to become a cardinal is now less than a day away. John and Julie Morand of St. Barnabas Parish in Indianapolis also came to Rome, nearly 3 1/2 years after they joined Cardinal-designate Tobin on an archdiocesan pilgrimage to Italy in the summer of 2012. Carolyn Noone became emotional when she talked about this special weekend that marks the latest chapter in this Catholic-American success story.